In modern homes bathroom is not just a functional part of living space, intended for performing hygienic routines. It is more likely a place where you can relax and shake away all stress of the day, to stay by yourself and regain a piece of mind. It can be called home SPA-salon and beauty parlor at the same time. 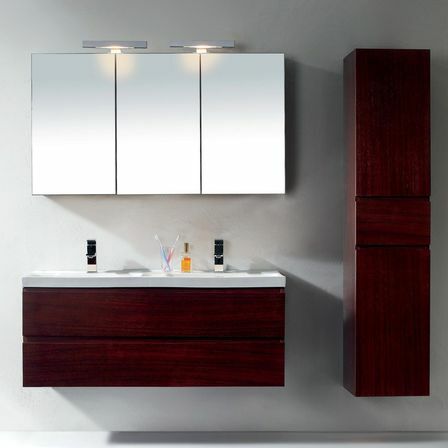 All these functions make bathroom mirror inevitable part of bathroom furniture and décor. In most cases such useful interior element as a bathroom mirror is being chosen after bathroom interior had been completed, plumbing facilities had been installed and bathroom furniture had been bought. This approach makes some sense because it ensures that bathroom mirrors matches other interior elements and naturally fits in general design complex. It also spares some time, narrowing wide choice of bathroom mirrors to a certain criteria of particular design. On the other hand, for those who choose bathroom mirrors of complex shape or unusual design it is strongly recommended to plan it right from the beginning, before bathroom interior design is planned. Being interesting element of décor. 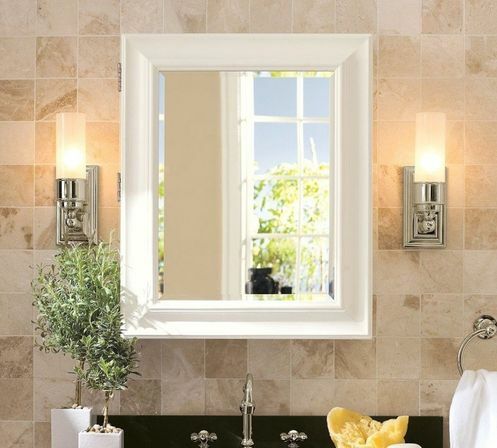 Main functions determine criteria for choosing bathroom mirrors: size, shape, décor and mirror surface quality. 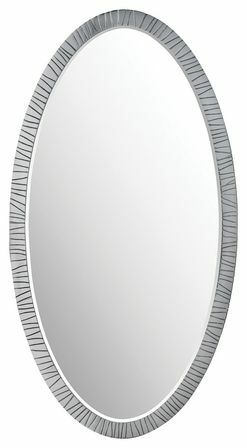 In shops can be found bathroom mirrors of different shapes, it is also possible to order unique bathroom mirror, made by customer’s sketch. In other words, nowadays bathroom mirror shape is limited only by fantasy and even wildest ideas and projects can be actually materialized. Despite all of that, most bathroom mirrors have classic shapes, approved by time. The most popular configuration of mirror since early historical eras till today has been oval shape. With oval mirrors bathroom space gains their functional benefits along with wide range of design possibilities. 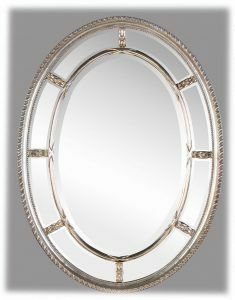 Bathroom oval mirrors suit most of interior styles – from hi-tech to baroque. Being far from complete list of advantages, it explains why most people intuitively prefer oval frames for their bathrooms. 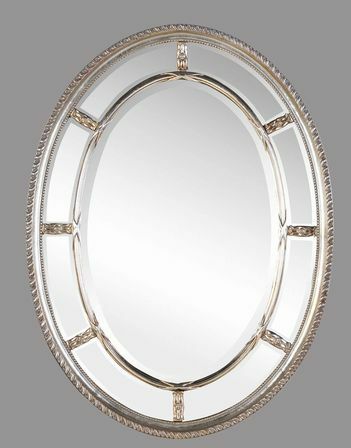 As it was mentioned before, oval bathroom mirror has been popular since early historical eras. This enables using oval-shaped mirrors in antique inspired bathroom interiors. 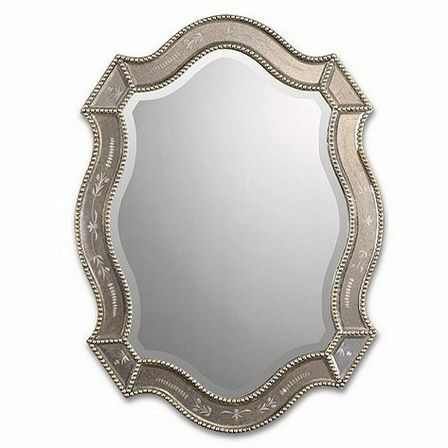 Old oval mirrors can be bought in antique stores, at antique auctions or garage sales. It also can be dug out of old things in the depths of old family mansion’s attic or cellar. 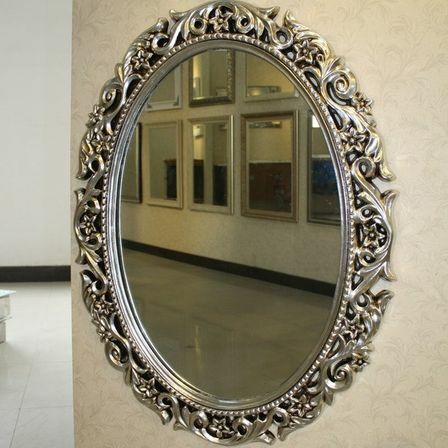 Genuine antique mirror, especially large wall mirror is worth to become a key decorative element of bathroom interior. Large modifications allow person to see full-height reflection which is very convenient. It can spare several minutes on busy morning, allowing person to check the whole outfit right there in bathroom. Big reflecting surface gives bathroom some extra space and extra light. Venetian vanity mirrors with artistically distressed mirror surfaces give bathroom a vintage Italian vibe. Antique vintage framed oval mirror for bathroom can also be used in creating romantic naïve atmosphere of vintage and shabby chic styles. Classic pomp golden frame of antique oval mirrors need to be supported by noble combination of white and gold in furniture and décor of interior. 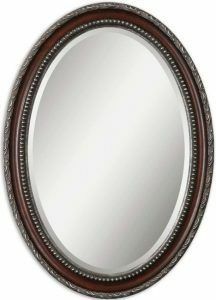 Matt painted antique framed oval mirrors look softer and can be fit both in neutral and bright color schemes. Being classic shape, oval mirrors look fresh and appropriate in any modern interior. 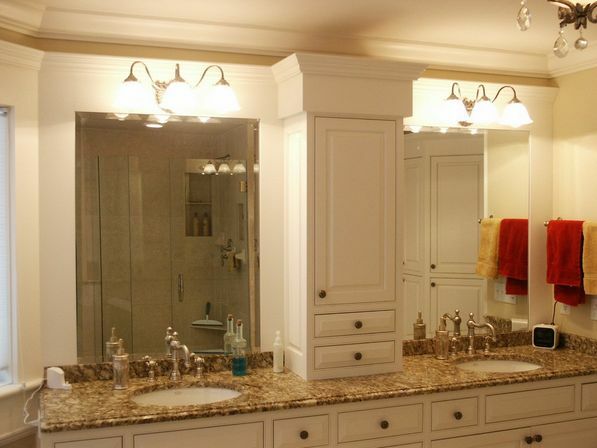 Different oval mirrors help create different mood in bathroom. 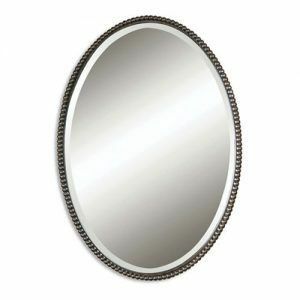 Frameless oval mirrors look very basic and simple. You literally can’t go wrong with frameless bathroom mirror. It can look good in minimalistic interior or in budget interior with no particular style. Without sharp outline such a mirror vanishes on the wall, creating illusion of extra space. 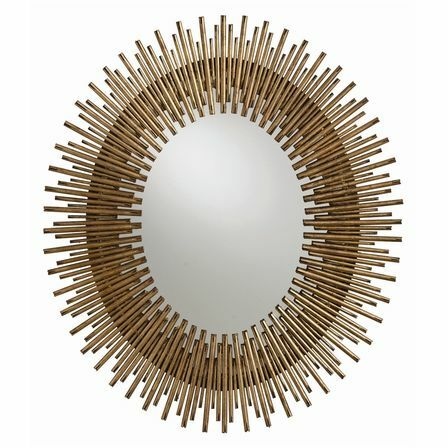 This kind of mirror, being highly functional, will not look too big and awkward even in tiniest bathrooms. 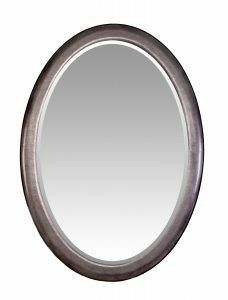 Frameless oval mirrors of different sizes or even combined with round mirrors can be hung on the wall to create a modern looking interior. 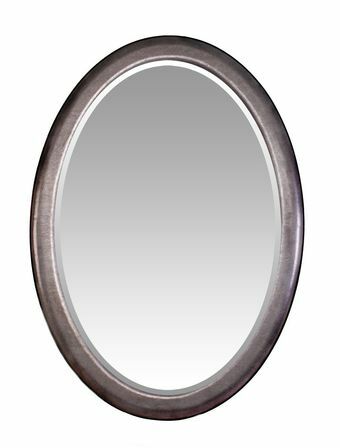 Frameless oval mirror is totally versatile – it can be used as vanity mirror or cosmetic magnifying mirror (both portable and fixed to the wall); as a large standing mirror or it can be built in the bathroom door or narrow closet’s door. Yet another strong point of frameless mirror is that it can be easily modified by framing or adding to decorative elements whenever wanted. With framed oval mirror bathroom can acquire a certain style. Material of frame sets stylistic direction. Laconic metal frames suit minimalistic, modern and hi-tech stile. Purposely shabby metallic or wooden rough textured frames belong to country rustic or loft styles. Yet another popular material for contemporary frames is plastic, coated with different colored paints. It is necessary to keep in mind that colored plastic frame should be incorporated in general color scheme. 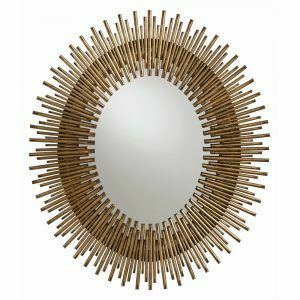 Oval mirror with lights. Best lighting solution for contemporary interior can become LED lighting. It helps saving electricity, provides enough light without casting unwanted shadows over face and looks sophisticated and stylish at the same time. Lighting fixtures can be fitted into front of mirror surface; they can turn form of different designs. Or LED strip can be situated along mirror’s perimeter. Very interesting visual effect has backlit oval mirror – it looks as if it floats in the air. Some LED lighting systems are equipped with color switch so that color scheme can be changed by flipping a tumbler. This can momentarily turn modern bathroom into romantic island for mental retreat and relax. 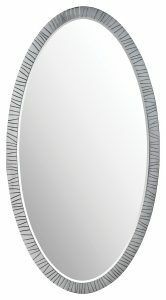 There are many modifications of different sized oval bathroom mirrors with LED lights that can be bought in such shops as IKEA, for example, or ordered online. There are two sinks in many contemporary bathrooms – for him and for her. Hanging oval mirror horizontally above two sinks corrects room with low ceilings and optically widens the room. Classic layout of two identical oval mirrors above each sink is a common option which suit most interiors. Oval mirror with shelves. Shelf helps organizing small toiletries and prevents countertops from clutter. At the same time it serves as decorative element. Oval mirror can look good with one solid shelf at its basis as well as with multilevel complex of shelves. 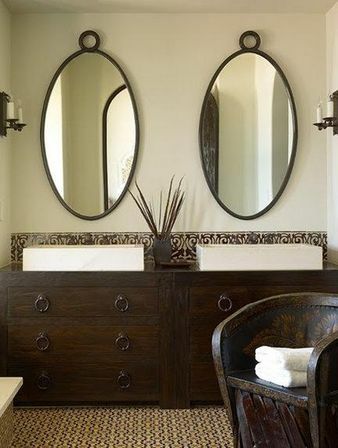 Oval mirror cabinet can become a good compromise for small bathroom interiors, combining mirror with place for storage.